Wherever you are in Crouch End or Muswell Hill you are never more than a short distance from a house or building built by the Collins family. This family of builders was started by William Collins (1856-1939) who was born in Hoxton. After an early apprenticeship, William set up a building company of his own and, taking advantage of the opening of the railways in the 1870s, began to buy up land in the vicinity of the newly opened railway stations. The phenomenal growth of Hornsey in the period up to the end of the nineteenth century was dictated by the demand for housing by the middle and lower middle classes who wished to escape from the more congested parts of London. 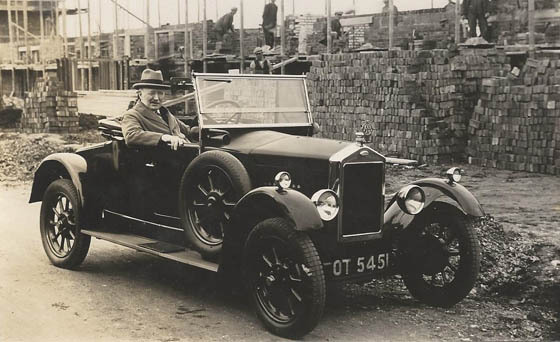 Collins’s first developments were on land that he bought in the vicinity of the now disused Stapleton Hall Station where he developed parts of Ridge Road, Oakfield Road and Stapleton Hall Road. In the Census of 1891 he is recorded as living in Stapleton Hall Road in one of his own houses. In this decade he extended his activities to the areas close to the Crouch End station and was building on Crouch Hill, Haslemere Road, Waverley Road, Avenue Road, Ivy Gardens and Elder Avenue. By 1901 Collins was building Church Crescent and the adjoining houses in Muswell Hill Road in Muswell Hill and had acquired the land for the Fortismere and Rookfield Estates. Taking advantage of his acquisition he and his family were living in some splendour in Fortismere House, the site of which now lies under Fortismere Avenue. Work started on the Fortismere Estate in 1903, which comprises the five Avenues from Birchwood to Collingwood Avenue and Grand Avenue and the individual houses were substantially completed by about 1908. The flats and shops on the periphery of the estate were mainly built about the same time with the exception of the block at the corner of Fortis Green and Fortis Green Road which was built later. Before the Fortismere estate was completed, Collins began building the Rookfield Estate with the first houses in Rookfield Avenue and Etheldene Avenue. By this time his two sons W B and Herbert began to take part in the design of the houses and Herbert is recorded as the designer of the first houses in Rookfield Avenue. Prior to this the plans of houses submitted to the Hornsey Council for approval were signed by W J Collins although it is not known whether or not he was the designer. To allow the completion of the Fortismere Estate, Fortismere House was demolished and W J Collins moved to Rookfield House which in turn was demolished to allow Rookfield Garden Village to be built after which W J moved to Southampton. After Herbert joined his father in Southampton, W B Collins completed the Rookfield Estate. Other flats in Fortis Green and houses in Twyford Avenue and elsewhere were built by W B Collins. The Society has published a book The Rookfield Estate – Muswell Hill’s Garden Suburb by David Frith which contains many more details about the Collins Family.